Lisa on deviantART knows you can’t go wrong when you mix evil and adorable. 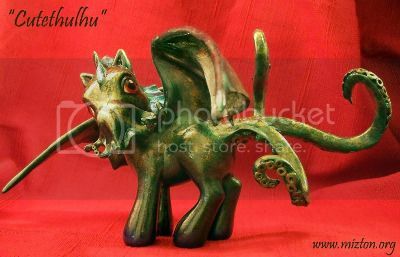 Via Toycutter, who cannot explain your inexplicable fascination with Cthulhu, so stop asking. You can find the Cthulhu plush on thinkgeek.com too, that’s where I got mine; he guards my cubicle at work. Still more fearsome looking than Chibithulhu!